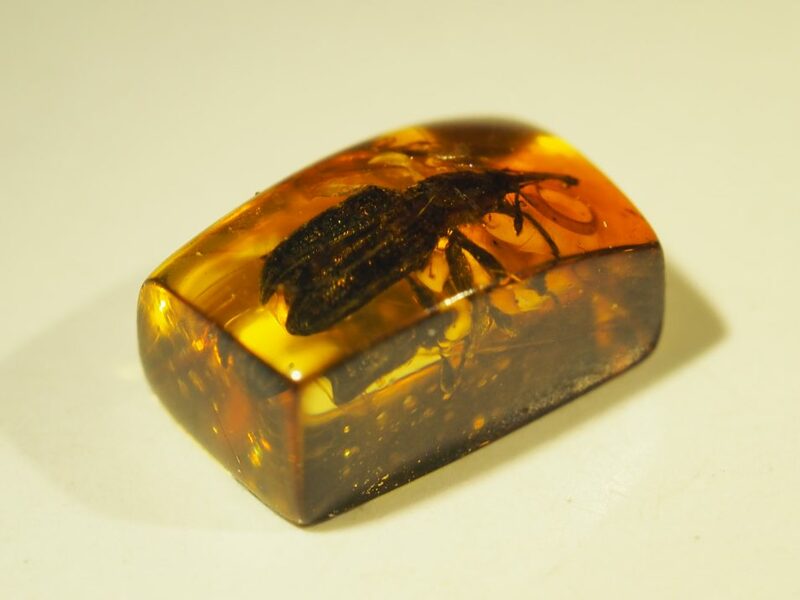 When you think of the age of dinosaurs, do you think of weevil fossils trapped in amber? Well, these small little beetles are being used to reconstruct and provide insights into an ancient ecosystem. Forget Jurassic Park, this is real-world science. “We have uncovered 52 new weevil species from the Cretaceous Period (145-66 million years ago). Most of these belong to an entirely new family of weevils,” says Dr Rolf Oberprieler of our Australian National Insect Collection. 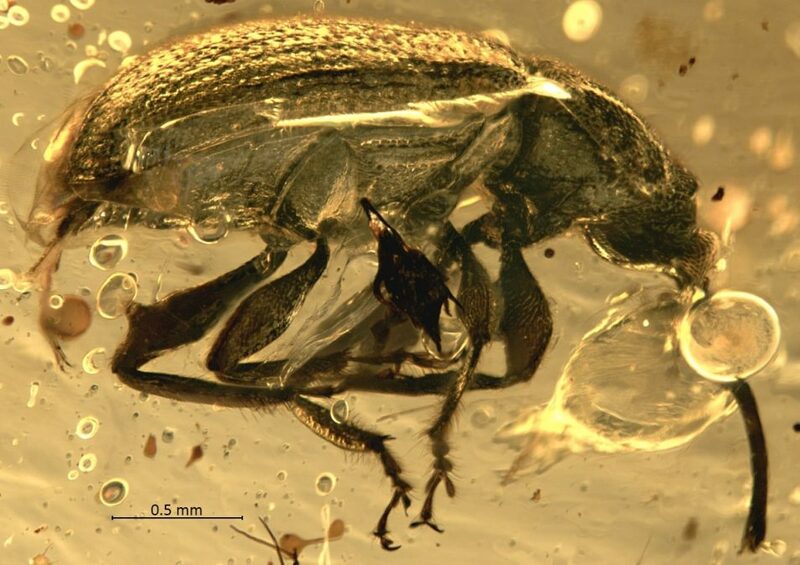 This unfortunate weevil has been trapped in amber for the last 100 million years. 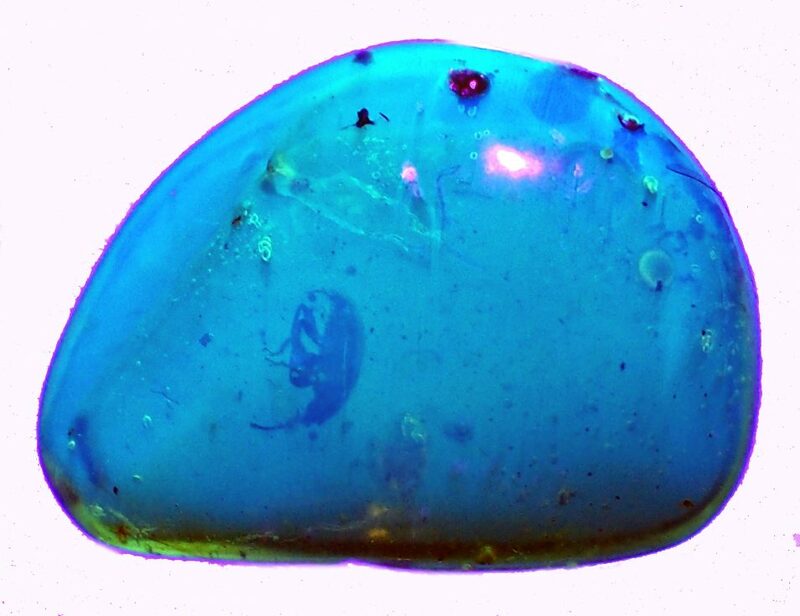 The amber, mined in Myanmar and about 100 million years old, contains fossils of weevils and flowers from when flowering plants (angiosperms) began to diversify. Back then, the world looked very different; the plant world was dominated by conifers and ferns as there were few angiosperms such as grasses. “The species of this new family of weevils were early flower or seed predators of the first angiosperms. Our research provides a snapshot of them evolving and adapting to the angiosperms on which they lived and which they may have also pollinated,” says Rolf. Did you know amber glows under UV light? The colour and brightness can tell us a lot about the amber. 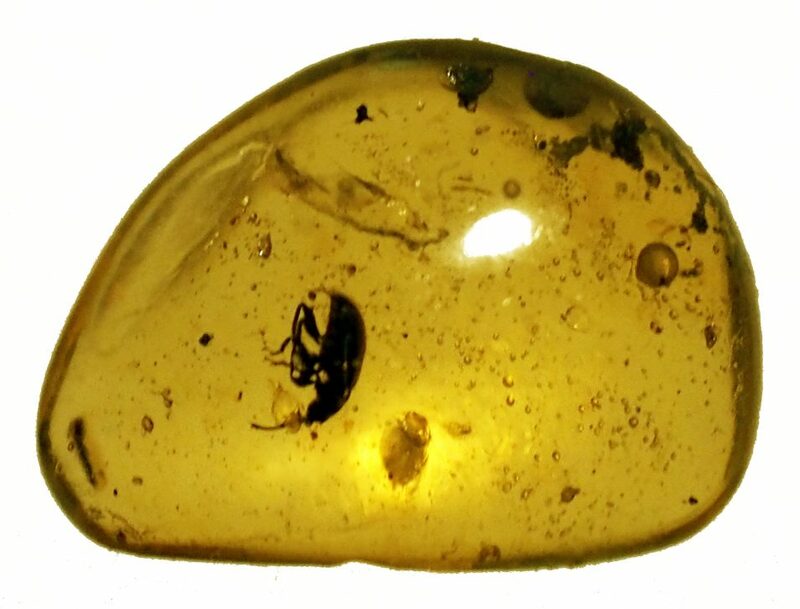 The weevils and the angiosperms trapped in Burmese amber are now extinct. Nevertheless, these fossils allow scientists to understand the link between dinosaur-age weevils and those found today. “Our new research also fills a critical gap in the fossil history of weevils, as very few other weevil fossils are known from this time. We had no real idea of what the weevil fauna from 100 million years ago looked like,” says Rolf. For these nimble, long-snouted weevils, the flowers of the earliest angiosperms were perfect places to lay their eggs as they contained seeds – a ready, hidden and protected source of food for growing weevil larvae. Today’s weevils also develop in the seeds of many flowering plants. They are so specialised that many will only attack one species of plant. Because of this ability to not go rogue, weevils are often used as biological control agents for controlling weeds. But seed-destroying weevils can also benefit their host plants by serving as their pollinators. The more primitive angiosperms of today, such as nutmegs, are pollinated by the same weevils that develop in their flowers and seeds. It now appears that this association between plants and weevils may have evolved in the Cretaceous period. Their lineages evolved and diversified together to the extent that both are now amongst the most successful branches of the tree of life on earth. Many of the specimens are prepared by being cut into small, regular pieces. This one is only a few millimetres across. The researchers use cutting-edge technological tools to examine the weevils, forever trapped in amber. “Amber forms from a thick, viscous resin and is cut and polished into rounded blobs. These shapes cause light to reflect and refract strangely and make it impossible to properly study the weevils,” says Rolf. Researchers get around this problem by cutting the amber pieces into squared-off shapes, usually only a few millimetres in size, with straight edges and flat sides. They need to cut as close to the trapped specimen as possible as amber often contains bubbles or impurities that obscure the specimens. When such trimming is insufficient to study the specimens, researchers have begun to use modern methods such as micro-CT imaging. This process uses x-rays to generate high-resolution 3D images, which can be manipulated, rotated, enlarged and analysed in great detail. This is made possible using special software programs such as Drishti, developed by Dr Ajay Limaye of the Australian National University. With Drishti, specimens in amber can be digitally freed from all obscurities and examined from all angles without interference from reflections, image distortion or bubbles in the amber. The resulting 3D models present unparalleled views of the specimens and virtually bring these ancient, extinct weevils back to life. Close up you can see the bubbles in the amber which obscure the weevil specimen. Want to uncover some insects yourself?